Later in the new building, Lisa Gannett, Nina’s “Speedy Kids” coach (a philosophy professor at Saint Mary’s University), suggests I contact Mookie Magloir to learn more. 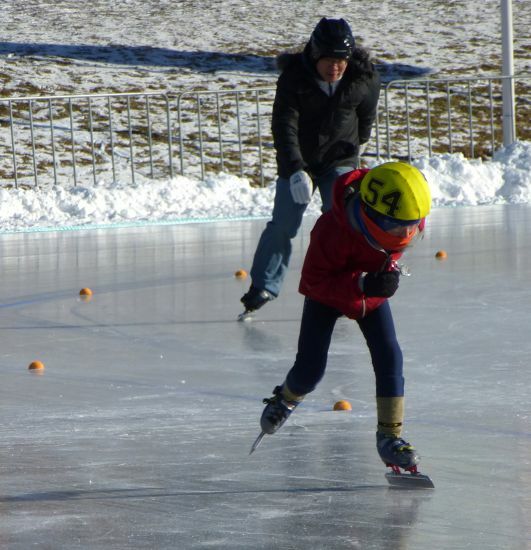 On the way out, another coach, Maartje Stroink, and many parents are busy adjusting and clipping shut multiple skates—all in a day’s volunteering to make this newly-born community run smoothly. Maartje tells me they can always use more volunteer hands. One boy asks if I can help him but I’m not much help because the club’s skates are laceless and I can’t figure out the mechanism. But he is able to do it himself and seems pleased about that. The fact that leaders like Lisa Gannett, Todd Landon, the CSC-Atlantic Coach/Regional Development Mentor hired by Speedskating Canada, Mookie Magloir, Recreation Director at the George Dixon Centre, Sheila McGinn, coach of the Nova Scotia Masters Speedskating Club, Sheila’s husband—organizer Steve MacMurray, President Brad Holwell and coaches, Carolyn Jarrock, Jonathan McNeil, Cassidy Bradley, JP Daigle, and Fiona Gouthro at the Halifax Regional Speedskating Club and the Valley Speedskating Club have enabled this sport to take off to such a degree is truly moving. Lisa says, “Mookie got it going at the George Dixon Centre through their after school program. Now, there are 25 four to seven year-olds who walk the 1.4 kilometres each way once a week to attend an hour lesson while the eight to twelve year olds come on an alternate day.” When I call Mr. Magloir, he tells me that, before the Oval, he would flood the basketball court with a hose but when the Oval became permanent and Speedy Kids started their inline skating classes, the George Dixon Centre incorporated that activity into their after school recreation program as a choice which allowed the participants to get used to the equipment and the space. “That made the transition to the ice easier,” he said. Many citizens of HRM will remember the outcry when the Oval, which was a temporary installation for the Canada Games in Halifax was to be dismantled. Citizens had gotten a taste of skating on this luxurious smooth venue before the games and they didn't want to lose something that gave the Halifax region such a boost for health, recreation, status in Canada and a unique setting for everyone in the downtown area. Though not expressed this way, it was as if a new star had been born and many wanted to revolve around it permanently. Spearheaded by a group of citizens, a campaign to keep the Oval took off as fast as Korean short track sprinters! The municipal government under Mayor Peter Kelly caved under the wave of enthusiasm washing over the municipality. The people spoke loud and clear and the ice stayed. I’ve been on the edge of this exciting speed skating sphere at the Oval for three years now, since my uni buddy, John Maurice (founder of the Nunavut speed skating program out of Iqaluit) arrived for the 2011 Canada Games in Halifax and gave me skates his club was discarding. Worn knees and hips from a life running have been nursed into better shape by my many 400 metre orbits around this fabulous facility in the “Commons” heart of Halifax. Looking out at these speed skater racers of all ages, abilities and backgrounds, taking to and leaving the ice as their race is called, the whole scene and what has led up to it in the past five years seems like the birth of a new solar system under the “star” of what was formerly the Canada Games Oval, now the Emera Oval. The private corporation which owns Nova Scotia Power was one of two corporations (along with Molson Coors Beer) that won the naming rights for a mere half million over fifteen years. Not bad considering up to 2000 skaters a day zoom or saunter by their name on banners around the expanse. I think of this speed skating phenomenon like a revolutionary birth of a whole new design because it crosses age, gender, ethnicity and material lines. Every sub-culture in HRM is here in ecstatic orbit due to the accessibility. I talk with parents and adults across these demographics. 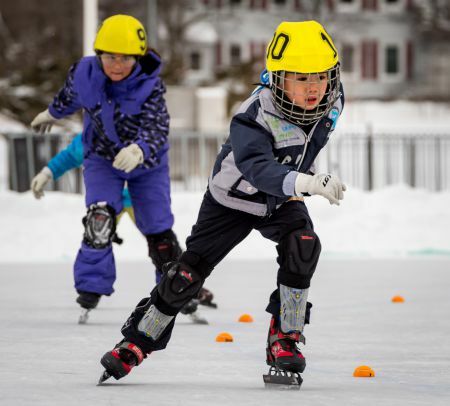 Susan Yu tells me that her six-year old son, Evan Ren Yu, got involved because there was not much to do outside in the winter and he enjoys the fun way “Coach Lisa” teaches. Susan sees that (along with the fact he loves going fast), as the reason he is enthusiastic about coming twice a week. She is happy he is learning proper technique, is getting out in the cold, fresh air and, as a result, falls asleep instantly at night. 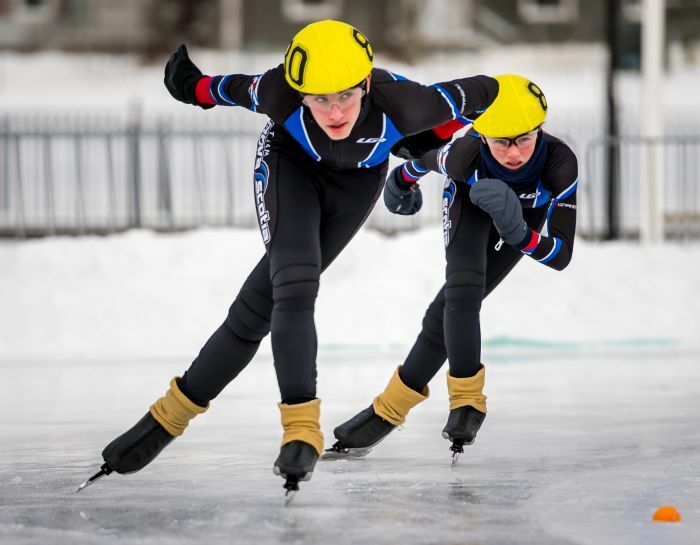 “I want to emphasize that the Halifax Club is BOTH a short and long track club. 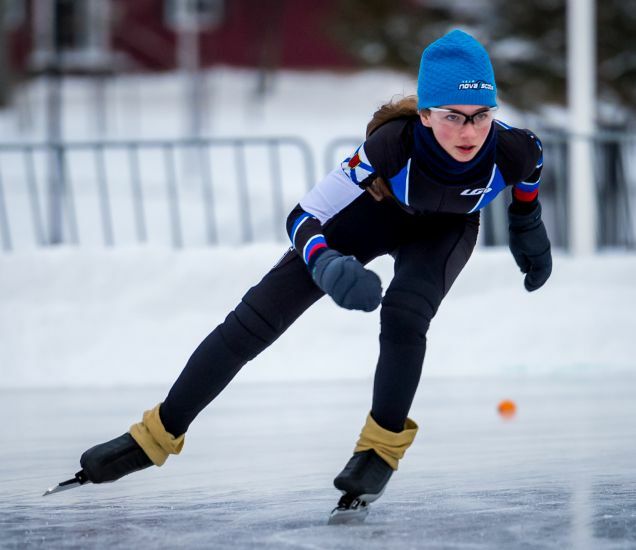 We try not to differentiate the specialties so much, emphasizing that first you should learn to be a good speed skater, then, much later, you start to specialize. Speed skating is speed skating when you are young. 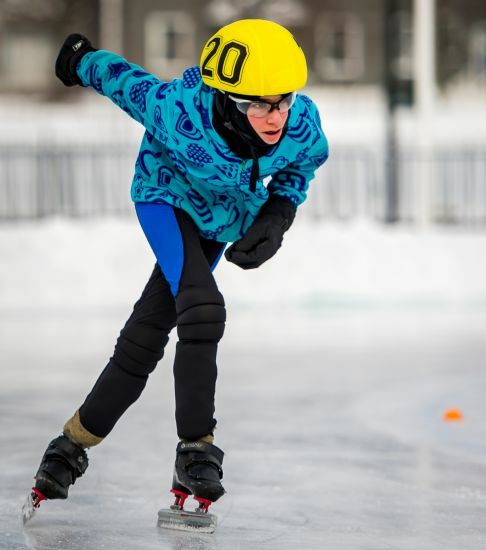 Our club offers practice on Tuesday and Thursday evenings at St. Margaret's Bay arena; also on Wednesday after school, Saturday morning and, for National competition qualifiers,Tuesday and Thursday at 7 am—all on the oval. 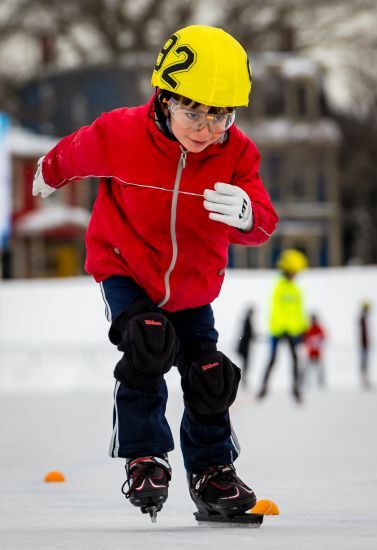 The Halifax club coaches also teach the HRM “learn to speed skate” program on Saturday mornings. This is free except for $10 that pays for Speed Skate Canada’s insurance purposes. it is not retained by the club or coaches. 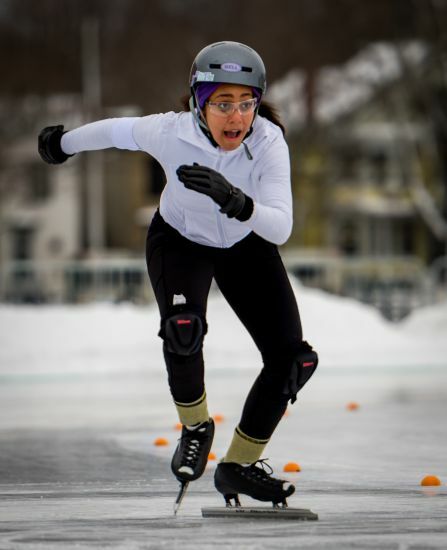 The Halifax Club recently had six skaters who qualified to compete at the Canadian Age Class Long Track Competition in Quebec. I was the coach and, in this role, represented the province. Our skaters represented Nova Scotia well. Luke Sullivan placed 10th over all in the country within his age category. Noah Ferguson-Losier won the top overall male skater in the open age category as well. All of our skaters performed exceptionally well and it was a pleasure to coach them. Back at the long track championships, I notice a couple with their son who’s taking off his skates after racing. I ask them if I can hear their story about their foray into speed skating. “Mom,” whose name I learn is Jacquie Jean-Joyce steps back and points me to her son so I can get it from the horse’s mouth, so to speak. (I like this gesture—a Mom who gives her son his own space to speak.) I learn from fourteen-year-old Aidan that he’s in his second year of speed skating. He tells me today was his first competitive race and his excitement and pride at getting it under his belt readily shows. 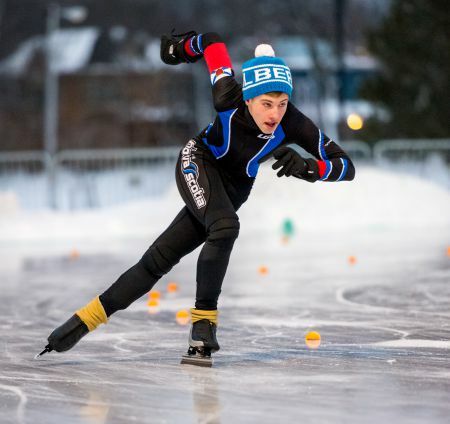 He says he was introduced to speed skating when his school class watched the Olympics and he got to see short track, which he immediately thought looked really interesting. From that point things happened rapidly as Jacquie’s co-worker, Kevin Goswell, very much into speed skating (being the Vice President of HRSSC), got Aidan “geared up” and on the ice right away. I ask him how he likes this long track racing as compared with the smaller ice surface and steep corners of short track. 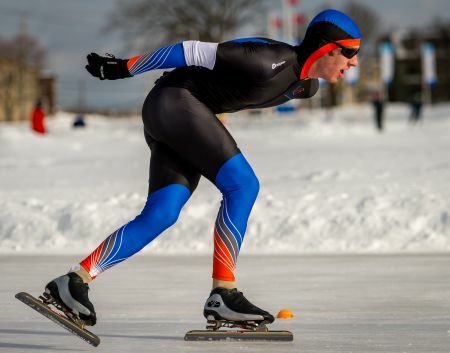 He says assuredly that he prefers long track now because, “It’s less aggressive and you have your own lane.” Aidan, it seems, is finding his own space to grow on the ice with the help of his parents, Alan and Jacquie. All the parents I speak with are obviously dedicated to this new sphere which offers so many obviously healthy and spiritually sound reasons for taking part. Most citizens will remember how hard they fought for this outdoor oval to be made permanent after the 2011 Canada Games. They can rightly say they got this all into orbit with their civic demanding that it be so. I’ve picked up energy myself from getting into the path of these parents and participants to hear a bit of their stories. 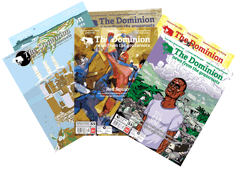 It feels good to be even a peripheral part of something as special as this. I’m thinking it would be nice to talk with someone whose achieved a high level of competitiveness as I know Nova Scotia sent a full roster of skaters to the Canada Winter Games hosted by Prince George, B.C. last year. I am walking down the corridor of the new facility when I see a woman by herself looking out the window. I decide to have one more go at gathering stories. It turns out I’m near the trail of a comet—Cooper Emin—the top ranked junior in Nova Scotia because this is his Mom, Alanna Emin. I remembered seeing her son skating three years ago at which time I had asked a few questions about speed skating to his father in the warm up portable on the other side of the track (!) when speed skating was physically separate from public skating (except for sharing the same surface). Everything has come a long way since then, including now eighteen-year old Cooper’s commitment to mastering speed skating at the highest level. Alanna tells me a bit of their starry story—that Cooper first laid eyes on speed skating at age 12 during the 2010 Winter Olympics while watching the short track competition. He took it up as soon as the oval opened. Seeing his flying frame flash by, you understand why so many kids are enthralled when they first see this kind of human speed in action. Alanna shares that the Nova Scotia skaters’ times improved by 60% at the Canada Winter Games in Prince George from the Halifax Games. She says Cooper calls his experience in B.C. “the best week of my life.” “He’s involved in a number of sports, including hockey, but speed skating is now his passion,” she adds. 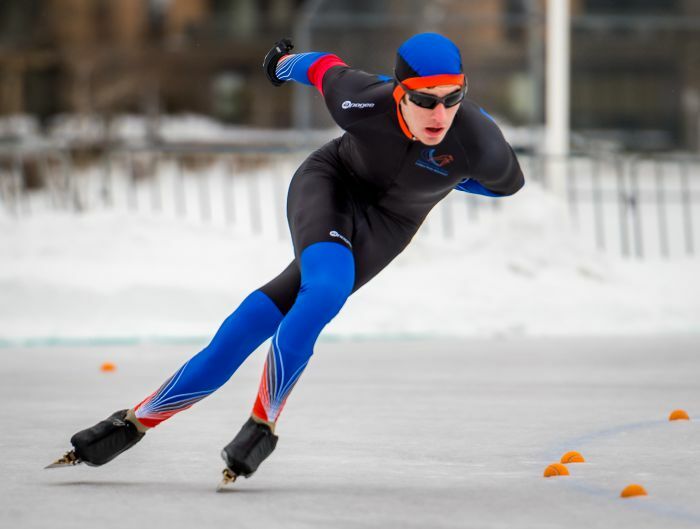 Cooper Emin is now in his first year at the University of Calgary where he can train on the indoor oval eight months a year. His times are goingdown, down, down. For the 500 metre, he posted a 36.95 seconds, only three seconds off the world record! He has now reached national level qualifying times. Last year he and some of his fellow skaters twere able to attend Canada Cup meets, the most recent seeing them racing in Winnipeg. As for me in this “space,” (and perhaps many like me now exercising muscles here they forgot they had), I’ve always want to extend the going fast of sprinting and competitive swimming to skating. I learned figure skating as a child and bought a really good pair of Donald Jackson blades at age 30 and skated wherever I could and eventually with the Saint John Master’s club for six years where I saw my first speed skaters in a city that produced a world champion in the sport in the the early twentieth century and is home to one of Apollo Ono’s coaches. When John Maurice passed me the skates in 2011, I felt like I had been handed the dream of Excalibur. It took me a year to get the courage to try it and this year I feel like I’m finally getting the technique a bit. Going fast (well fast for me) is a super way to feel rejuvenated. With the wind factor, I feel eighty years old on the back stretch and twenty on the home—my future and past stories inserted into my present 2016 body. But I contend that this is much better than feeling my age ALL the time. After taking the Level one officiating course, I broke the ice on becoming a timer at the Sunday morning races today. I moseyed over to the platform where six well-bundled up timers stood, stopwatches in thick-mitted hands facing the race’s chief recorder. One of the timers let me time a few races and it felt good to be part of the action, different from writing this story about it. 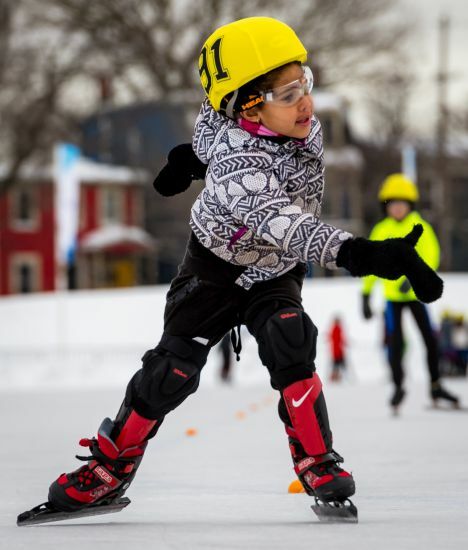 This timer told me that Halifax has a tradition from one hundred years ago of inter school competition—races— for the fastest skater. He feels that, since we are inherently competitive and, with the facility like the Oval, this type of racing would be a no brainer source of fun, morale and self-esteem-building and excitement, especially for youngsters and adults who don’t particularly like team sports or just want to beat a rival team. “We need to get Junior High schools, and even elementary, involved in this compelling activity starting with any kind of skates.” he says. It’s the commons, so the more common we can make it with intracity and inter community teams the better. After the races, all the timers head for the hut to have snacks and put away the stopwatches in their foam casings. One of the timers asks me what I had done at the event. I would have thought I’d be saying, “I got up the courage to approach the timers’ deck and observe the action to get acclimatized” because that was my plan. Instead, I was happy to tell her that I’d been able to stick my feet, or at least my index finger in the fray and time some races thanks to the friendly official who encouraged me to try. I go back to the car trying to decide whether to put on my figure skates for the first time this year and join a public skate. Already, a caravan of strollers pushed by mom and dad on skates and toddlers pushing their bright red early skating learning aids have launched themselves onto the sleek surface of the never-ending rounds of the Zamboni drivers. (They must get dizzy!). Since I’ve been speed skating, I’ve hardly donned my Donald Jackson boots so, wanting to feel the difference, lace up the battered but best steel in the world skate. Next to me, a young boy says to his Dad (who is lacing up his hockey skates for what may the 8th, 80th or 800th time in a long parental timeline of infinite orbits), “But I’m faster than him. 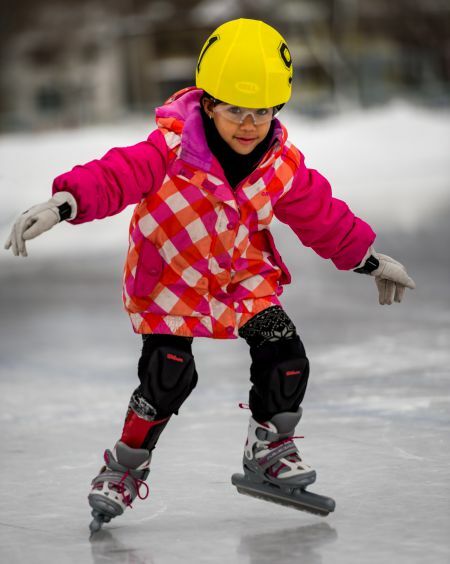 I can skate really fast.” His dad calmly corrects him, “No, you’re not faster than him…yet.” I can’t resist jumping in. “Would you like to go really, really fast?” I say to him. Dad explains, “He wants to beat his buddy” at which I say, “Have you tried speed skating?” and proceed to tell him this story in twenty words. “Thanks. We might try that,” Dad says and they’re off to start their orbit. And I’m off to finally file this intergalactic report— “Major Tom (who’s a skater not a junkie) to Ground Control”—before my solid rocket boosters are exhausted.